How to Convert DNG to JPG or PNG format on Mac? Convert DNG to JPG, PNG, or other image formats in batches, make graphics suitable for the web. Convert hundreds of images at once with just a few clicks. How to Convert DNG to JPG or PNG format? What is the DNG and JPG image format? DNG (Digital Negative) is a digital camera RAW image format developed by Adobe Systems in 2004. It contains uncompressed RAW images. The DNG Format is supported by most digital camera manufacturers, such as Samsung, Pentax, Casio, Ricoh etc. as well as by several types of software manufacturers, like Google, Apple and etc. JPG, also known as JPEG, is one of the most popular Raster image format currently in use, Many web graphics and digital photos are saved in JPG format. often referred to as a standard for uploading images online. One of its main advantages is providing a good graphic quality in a relatively small file size, which is easier to transfer or store. Why you need to convert DNG to JPG or other image formats? When you send photos to a client, colleagues or friends that clearly wouldn’t know how to view the file in .dng image format, or when you need to view photos and there is no appropriate software on your Mac. There is, if you want to transfer photos to your smart phone, upload to website, blog, or social media and so on. That’s when iWinSoft Image converter will come handy. So, how to convert DNG to JPG or other image format on Mac? The simple way to convert your DNG files is to get a quality piece of software, such as iWinSoft Image Converter. It let you easily convert images from DNG to JPG on your Mac. One big advantage of iWinSoft is the ability to batch convert DNG images to JPG files. So you can save the time. everything in one go and in only a few steps. Now you can download the free trial version of iWinSoft Image Converter as below to start converting your DNG to common JPG or PNG by the following step-by-step instructions. 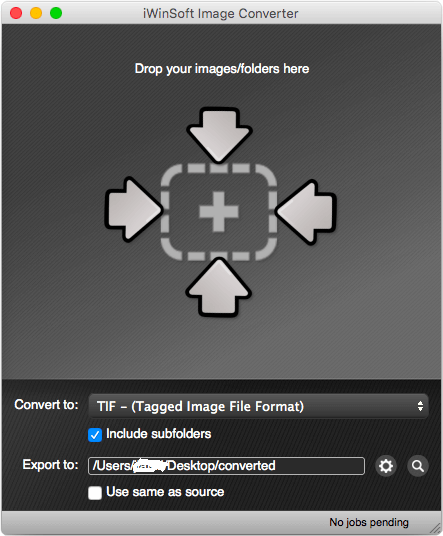 Click the "Convert to" drop-down list (more than 50 formats supported) and then pick the JPG as output format. 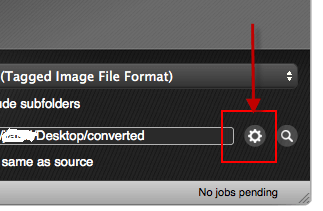 Click the gear icon at the bottom of the interface and select a folder where you want to save new JPG files. Add DNG files by simply drag-and-dropping them directly into the iWinSoft Image Converter main window, and your conversion will begin in no time! Done, Your JPG files will automatically be saved in the destination folder. As you see, converting DNG images with iWinSoft Image Converter for Mac is a real snap - just follow these simple steps to convert your DNG to JPG images quickly! Click to Download Now! 1. How to Convert EPS to JPG image format on Mac? 2. How to Convert NEF to JPG image format on Mac? Ready for macOS High Sierra 10.13.